Is there an iOS and Android version of the Gibi app for my smartphone? Is the Gibi App compatible with the current iOS and iPhone 7, 8 and X? How do I access the Gibi App? The Gibi App can be accessed on your smartphone, tablet, or computer. On your smartphone, download the Gibi mobile app from the App Store (iOS) or Play Store (Android). The Gibi web-based app can also be accessed on your smartphone, tablet, or computer, using a web browser (Safari, Chrome, Firefox, etc). To access the web-based app, go to login.getgibi.com. If using a web browser, create an easy to access icon on your smartphone or tablet. Save your log in and password for even easier access. See below on how to create an easy access icon. Is there a help menu for the Gibi Mobile App? To access the help menu in the Gibi Mobile app, tap Profile (found in lower right corner of screen). Then tap the question mark (found in the upper right hand corner of Profile page). Does the app support multiple pets? You can add as many devices to your Gibi account as you have dogs. Each dog will be indicated on the app with a different color paw print. On the web-based app, to center the map on a specific dog, click on their photo (or the default dog silhouette), if you haven’t yet uploaded picture of our dog. What is the Check In rate and how can I change it? Check In rate is how often the Gibi system checks your pet’s location. The default setting is every 15 minutes. To change the Check In rate, go to Settings, select desired Check In rate, then click Save. If you want to see where your dog is between location Check-In rate intervals, simply click Find. Please keep in mind that the faster the Check In rate, the faster battery is consumed. See FAQ on battery life. If your dog goes missing, we suggest to first assess how far away you are from your dog and the remaining battery charge. When you get closer to your dog, change the Check In rate to shorter interval. I pressed the Find button, why is the paw print for my dog bouncing? When you press the Find button in the web-based app, it initiates the Gibi system to find your dog’s current location. While the system is finding your dog, the paw print will bounce and the Find and Settings buttons will be disabled (greyed out). It could take up to 20 seconds to get your dog’s current location. When your dog’s current location is received, the paw print will stop bouncing, show your dog’s current location, and the buttons will be enabled for use again. How do I assign a safe zone to my dog? 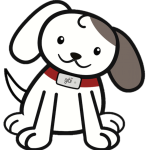 In the previous Gibi app, you had to assign your dog a safe zone. Gibi now monitors all safe zones you create. Your dog is either in or out of a safe zone. To turn on or off the safe zone alerts, go to Settings. See FAQ on Safe Zones. Can I see where my dog has been throughout the day? Using the web-based app on your computer or tablet, click Pet History to see where your dog has been. I only want text message alerts, can I change the setting? Account owners are automatically set to get both text and email alert notifications. To change to either text or email only, log into your account using a computer or tablet, go to ACCOUNT > My Account & Billing. Click My Account. Deselect the notification type you do not want. Click Save. Do not add yourself to My Contacts; otherwise, you will get double alerts. How do I change from Map view to Satellite view? Gibi uses Google Maps. Using the Gibi mobile app, tap the paw print icon above the menu on bottom. Tap the icons for map or satellite view. Using the Gibi web-based app on your computer or tablet, click the black tab with three white lines to the right of My Pets menu. You will see the menu to select Map or Satellite view. Satellite view is great when you are in an area with not streets, then you can use landmarks. How do I add friends and family to get alerts? On you computer or tablet, go to ACCOUNT > My Contacts. Click Add a New Contact. Enter your contacts name and mobile phone number and/or email for method to get alerts. Select pet you would like your contact to get alerts. Click Save. Please make sure to let your friends and family know that you have added them to get alerts. Account owners automatically are set to get alert notifications and do not need to be added.